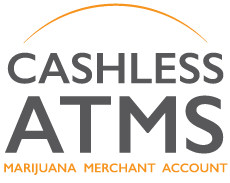 Currently there is no solution for accepting credit cards for ANY business involved in the direct sale of marijuana. However, MMA has a comparable option which allows your customers to spend more money on your products. A Cashless ATM or Point of Banking Terminals works similar to an ATMs except instead of withdrawing cash, a electronic transfer is initiated and funds are deposited directly into any bank account. As an additional plus transactions can be ran in $5.00 increments. Most major Bank/ATM Cards and Credit Cards using pin numbers are accepted. First, the merchant slides the customer’s card through the terminal. Second select which account to withdraw funds (checking, savings or credit). The customer enters their PIN# on the pin pad. The merchant enters the amount of the transaction (in $5.00 increment) and asks the customer to agree to the $2.00 convenience fee. The terminal connects to the ACH network and validates the transaction in a matter of seconds just like a regulare credit card transaction. Finally, our Cashless ATM Terminal will print out two receipts; one for the customer and a copy for the Merchant.